This week I was honored to sit down with teens and young adults to discuss novel writing and National Novel Writing Month (NaNoWriMo). Sharing my love for writing (and some of the tricks of the trade) is one of my favorite things no matter the age group - but there's something special about meeting young people who are so enthusiastic and serious about writing, and sharing with them things I wish someone had told me when I started this writing journey! 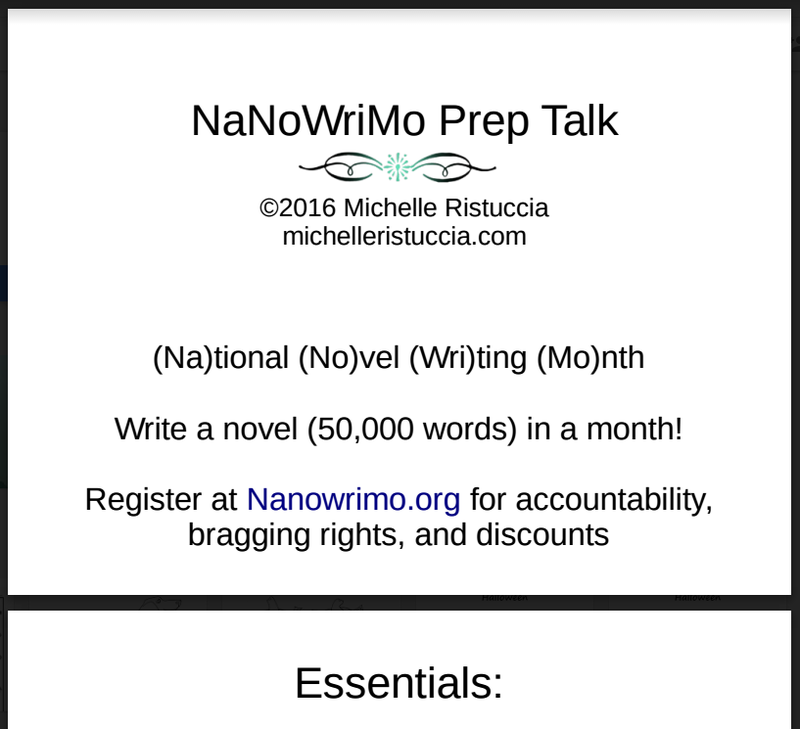 If you would like to learn more about NaNoWriMo.org or help spread the word, feel free to use my PDF presentation, "NaNoWriMo Prep Talk." 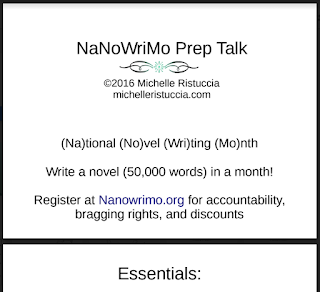 The presentation gives a general overview of NaNoWriMo and some of the strategies that help authors push through to that 50,000 word goal. I don't explain the strategies in the PDF (I did that in person) but you can follow the resource links at the end and use the lists as a springboard to google more about them. View and download the PDF here. Download and share the PDF however you like! If you have anything else to add, or a blog post related to NaNoWriMo and novel writing, please share in the comments. Ready to write a novel for November? You can add me on NaNoWriMo.org as mrsmica. Signing up at NaNoWriMo.org is free and serves as a unique chance to keep track of your progress while connecting with other writers, and the NaNoWriMo newsletters offer advice and encouragement all through November and a little throughout the rest of the year. As for me, I'll be working on my fantasy series Dragon Islands. One NaNoWriMo I wrote over 80,000 words to start the series off (no one was more surprised than me when I hit 80k in a month!). Through subsequent editing, outlining and writing parts of the rest of the series, that draft has literally doubled in word count and become the first two books. Most of the editing and beta-reader feedback has focused on the first book, so for this NaNoWriMo I'll be going through the second book and possibly writing the draft for the third book. At the time I'm writing this post, I have done exactly 0 prep for November (sob, irony) unless you count all the years of writing and editing the first two books, so I'll be spending the last week of October mentally preparing myself by reading over what I have so far and notecarding. I don't expect to hit 80k again due to life complications (3 young kids, haha) but I would be ecstatic to reach the end of book 3, and happy to at least go through the second book with edits and added scenes. Those are my super goals and goals, respectively.